'Radicans' is a fast-growing tree with a columnar to pyramidal growth habit. 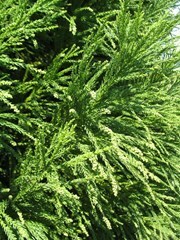 It has dense, blue green, feathery foliage that retains its color in winter with less bronzing than other Japanese cedars. ‘Radicans’ grows 30 to 40 ft. tall (sometimes up to 50 ft.) and 15 to 20 ft. wide. It is less prone to tip blight and leaf spot but is more susceptible to root rot when young.